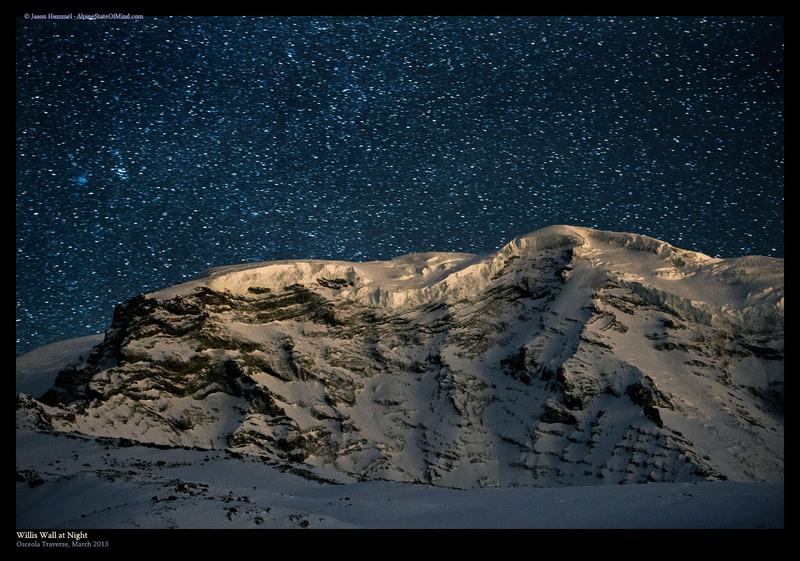 The NW col is a special place to collect your wits.� A tall drink of cool water, the line below sports quite steep skiing for 1500+�, then another ~4000� to our bivy in the hole of Bridge Creek.� Recommended.� And, with this week�s low-ish snow levels, sometime soon you folks might like to have a look at this and/or the line (east face/gully) Sky and Ross established to the east of the summit, back in our previous �worst ski year� of 2005. This tour is an instant classic through inspiring terrain. We enjoyed settled powder for the majority of the steep and sustained upper section, owing to its high, relatively sheltered, and NW aspect.� A thrilling ski!� The sun does get on the line in parts lower down, but there are a couple route options to mitigate exposure to sun effects.� And still lower we enjoyed hippie corn skiing. Memorable ski, topped with celebratory comestibles and combustibles--simple gentlemanly pleasures including good food, cigar and music by the creek, soaking in the day and the magnificence of peaks around us.� Adventure fix accomplished. Get it while (and if) it lasts! steep and deep and just plain ole grand! inspiring stuff, thank you! Gnar-lometer pegged? Check. Super-duper crazy s#*t & elegant tour. That looks like a bangin' good adventure. Excellent report, gnarly route & photos too. Rock on! Such a burly line and incredible pics too! Was this a first (known) descent? Certainly won't be the last after this TR! Instant classic for sure. Nice work, Erics! Thanks for the grand trip report, looks fantastic, although front pointing for turns is past my comfort zone! Nicely done! I heard a rumor that something Rad was gonna go down on Goode. Cooler than a moose & twice as hairy!! Awesome trip and slick writing, Eric. Once again making the incredible credible. Dave, I sure hope the general population of TAY readers realizes how gnarly this trip is, and that it's only suitable for a select few. Very cool, strong work! Thanks for the inspiring photos. Way to score E-$ and EZ-E!!! Some routes are deceptive in their gnarliness; it'd be impossible to climb this one (or, indeed, reach the base of the route) without getting a clue. Only the dangers of hidden firm snow/ice and warming-driven instability are invisible to the untrained eye. Eric's photos from the North side of Black looked even steeper. 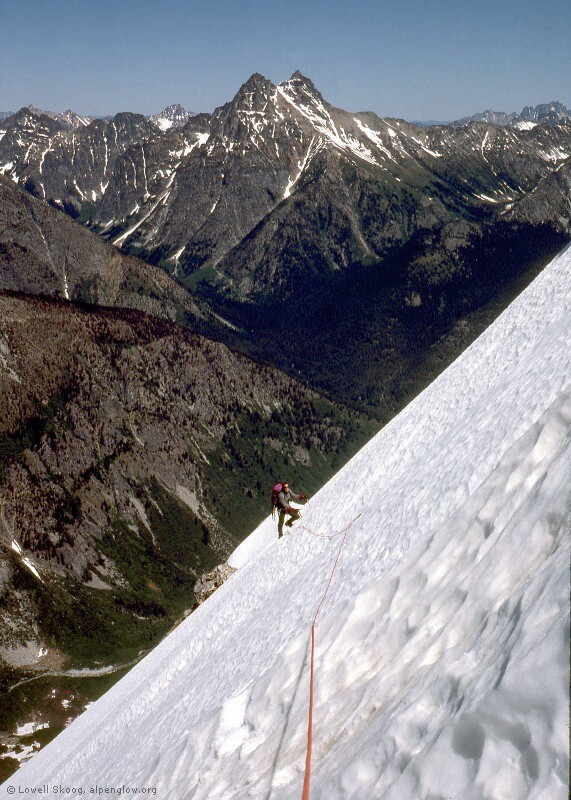 Climbing the adjoining ridge the following summer left me thinking, "Those guys skied that?!" I'm glad to know that there are people who will ski things that are steeper than I'll ever go, and even more glad to know that they've come home to share their experience. Wowzers!! Love that shot of EZ traversing at top. Congrats again you two. Looks like the cool temps this week and maybe some precip should keep the window open a little longer for further adventures? Good style! Thanks for posting such a special adventure. Congratulations on a safe and successful trip. 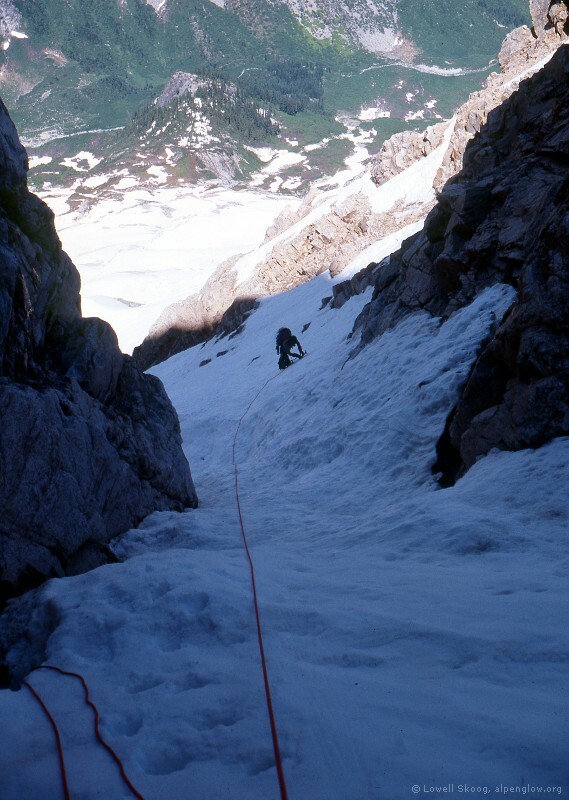 In the past, I've called this the North Couloir, rather than the Northwest Couloir. Somehow the name Northwest Couloir feels confusing being located adjacent to what Beckey calls the NE Face. Maybe the problem is with Beckey's nomenclature, not yours. 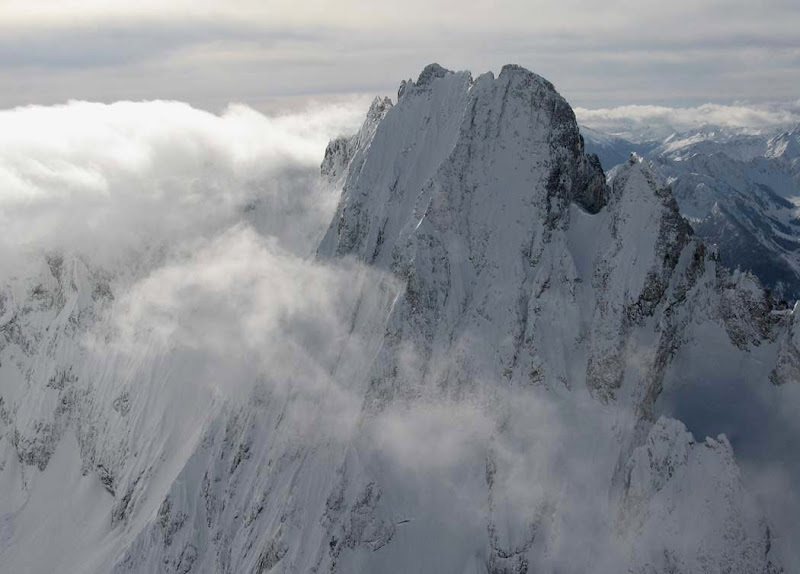 In any case, I'll add this to my list of noteworthy Cascade ski descents. I wonder if the lower couloir that you climbed is a new climbing variation. Beckey only describes a route that traverses in from the NE Face ice sheet. (That's the slope with the fracture line in your 11th picture.) 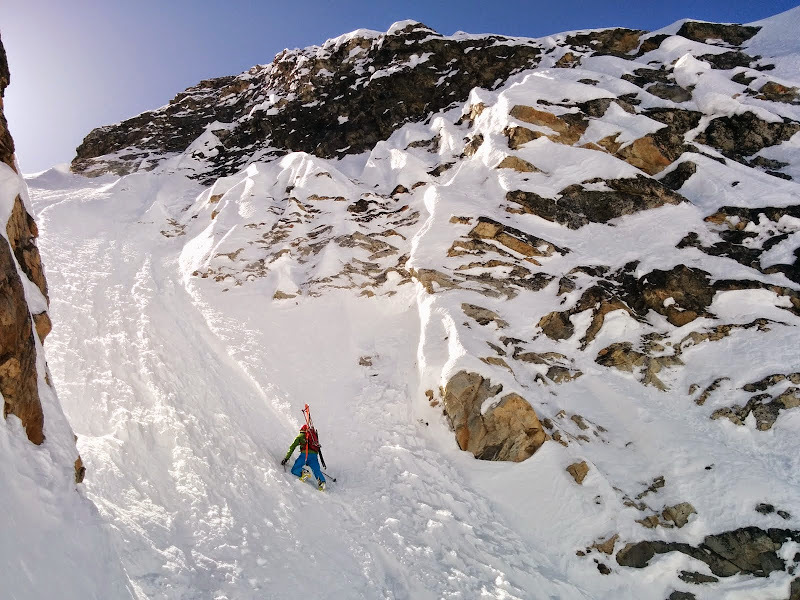 The lower couloir may melt out later in the season. For that matter, I think the entire face is probably a lot leaner these days than it was in 1985. Here are a few old pictures. Awesome! I was looking at that line last time I was below that face. Very awe-inspiring place to be. Way to go guys. Thanks all for sharing the stoke, it was too much for my puny heart to contain, glad you enjoyed the story. �I forgot to add the sad ending: skiing the hard snow through the final trees to the Rainy Pass trailhead, a random hard trough spelled the end of my trusty Wailer 99s. �One of the skis broke in front of the toepiece � -- although to its credit I didn't notice 'til we were back at the car. �Nothing a good cry, a beer and a cigar couldn't fix. Calling our line the NW couloir seemed reasonable by virtue of its position to the NW of the summit, and proximity to the nearby NW Buttress. 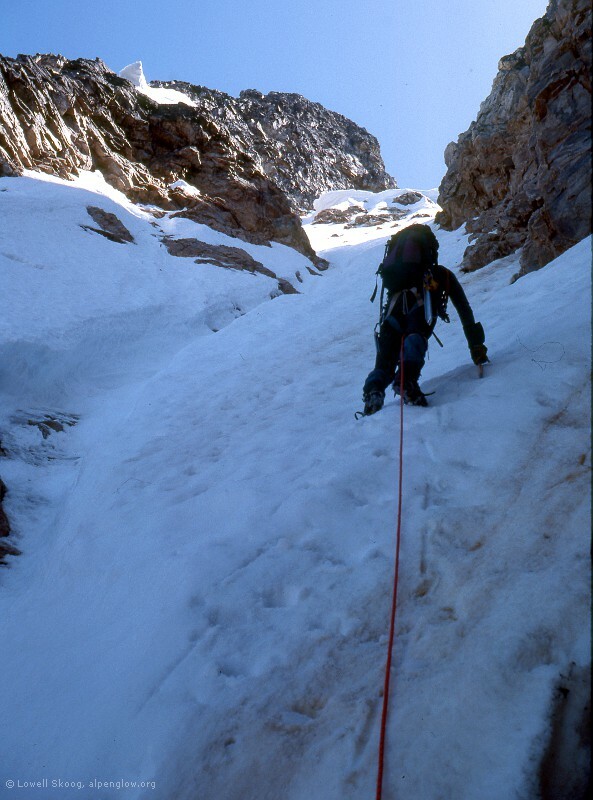 �But N Couloir works for me too--that's the primary aspect for the line. To reduce confusion, perhaps we should call it "And the Ugly" Couloir, as in the Goode, the Bad(e), and the Ugly.